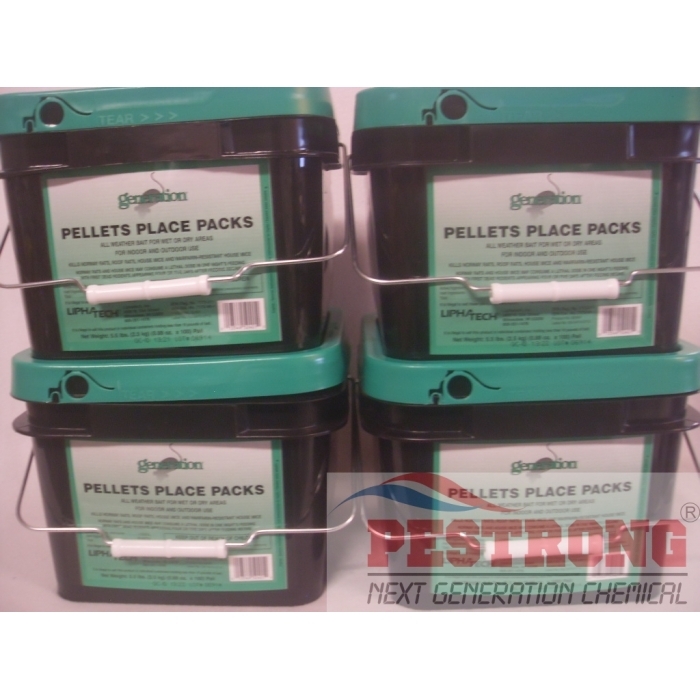 Where to Buy Generation Pellets Place Packs, Generation Pellets Place Packs - 4 Pails of 100 x 25 Grams - $209.95 for Sale with Fast Free Shipping! Generation Pellets Place Packs - 4 Pails of 100 x 25 Grams is all weather bait for indoor and outdoor use of wet or dry aeras that kills norways rats, roof rats, house mice and warfarin resistant house mice. Generation is a unique, single-feed anticoagulant specially formulated to be highly palatable to rats and mice. Advanced chemical synthesis allows difethialone to be formulated at 25 PPM. A low level of active ingredient makes generation extremely palatable – almost non-detectable by rodents. Whole grains combined with less wax and dye contribute to the great taste. Extremely effective for roof rat control. Sold by 4 pails only due to EPA regulations, not for sale separately. Extremely potent poisonous baits. Most baits require the pests to consume a significant amount of the poison before it starts to kill them. And others require some time for the poison to take effect. This one is one of the few that is capable killing a rodent after one feeding. This is deadly stuff, so I only use these when either I'm called in when there is a serious infestation, or if there is a significant risk in using the product. In any case, this is one of the most effective ways to kill a rat.